i think I’d enjoy a fast-paced job at boss lady pizza. 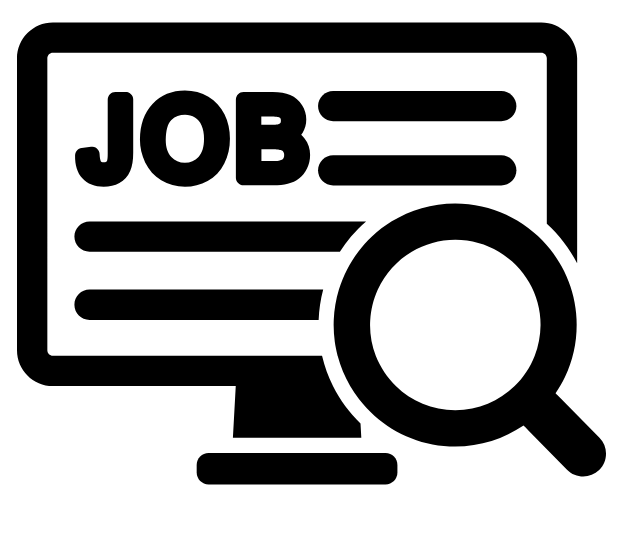 what positions are open and how can i apply? how many slices are in a pie & how many people do they feed? what are my crust options? 1) House-made hand-tossed New-York style. Thin, floppy/foldable, crispy on the bottom, hot & chewy in the middle. Available in 12”, 16”, and 20”. Every pie made-to-order, from scratch. 2) Gluten-free crust in the 12” size only (see dietary restriction & menu FAQs for more info). I see you offer 1/2 & 1/2 pies. Can I order 1/4-pies? No. 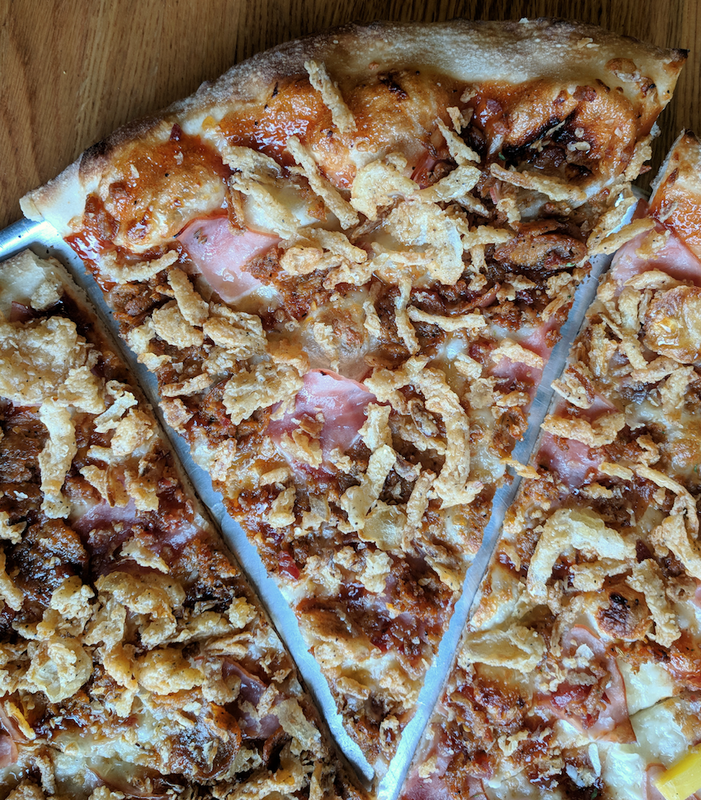 But if you are looking to try a greater variety, we’d suggest ordering Delivery by-the-slice (daily until 8:30pm), or just stop in and hand-pick slices from the window. You can try up to 8 different slices in one 20” box! No. Our menu offers house-made pizzas, salads, and desserts. However, we do have a couple of pies that come with a top-crust for a calzone-effect: Hot Pocket (pictured) & Spicy Dilla. See “White Pies” section of our menu for details. do you offer goat cheese? No. A list of our premium house-shredded cheeses can be found on the “Build Your Own Pies” section of our menu. why isn’t my hand-tossed pie perfectly round with 8 identical slices? what is your in-store vibe like? Boss Lady Pizza is a v casual, quick-serve, pizza by-the-slice experience. 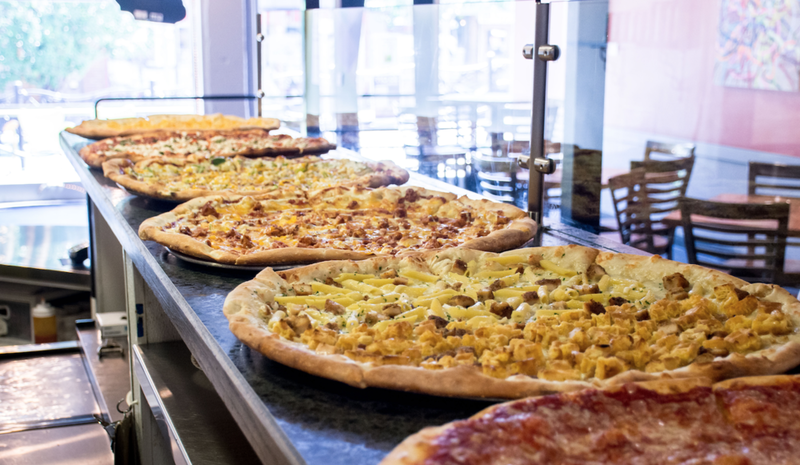 A large variety of Specialty Slices (1/8th the size of of a 20" pie) are displayed in our pizza window. Choose a specialty, and we crisp it up on the spot. Of course customers are welcome to dine-in with a whole pie, or take anything to-go. Craving something you don't see in the window? We can make anything to order if you are willing to wait (typically 15-25 minutes)! On occasion, we may even be testing off-menu recipes, so you never know what will be available! can i reach over the glass? i pride myself on being a supporter of small, local business. what can i do to support yours? 1) ORDER DIRECT! You’ve probably seen that Boss Lady Pizza is offered on multiple online ordering platforms besides our direct platform, namely Grubhub and Hungrybuffs. We are partnered with other platforms in order to stay competitive in the pizza market, but from a small business standpoint, please be aware that there are costly commission fees associated with every order placed on these 3rd party platforms. The best way to assure our small, local business retains our profit margins, and are thus able to re-invest in our business/decor/employee wages/menu development, etc, is by ordering direct from our website, which have 0% commission fees associated. We try to make ordering direct a favorable experience by charging no additional transaction fees, providing accurate real-time quotes, and free Bossy Sauce (or other select dipping sauces) with Whole Pie orders, and [coming soon] ability to earn points in our #BossLadyLoyalty program! 2) PURCHASE & WEAR EXCLUSIVE BLP MERCH! Purchase in-store to save on shipping fees! & get a free slice with your hat purchase! Do you have Vegan cheese? Yes! Due to popular customer demand for a dairy-free cheese option, we launched our house-made Garlic Herb Vegan Ricotta in January 2019. It’s a soy-based cheese that is nut-free, gluten-free, and obviously dairy-free. Our house-made Vegan Ricotta (as a topping) costs the same as any of our dairy cheeses, and you can add it to any pie (including our Vegan Specialty pies) when ordering direct! Do you have Vegan crust? Yes. Both of our crust options (regular NY style and GF crust) are vegan. Can I order Vegan by-the-slice? You can Build-Your-Own Vegan slice on Gluten-Free crust. Otherwise, if you prefer our Regular Crust, you can Build-Your-Own Vegan whole pie (12”, 16”, or 20”). Both options are made-to-order, just ask us for a quote time! Which of your bases & toppings are Vegan? Please refer to the “Build Your Own Pies” section of our menu for all of our current Vegan offerings. Is BLP ok for true Celiacs to eat? We would not recommend it. Our Gluten-Free crust is locally sourced from Deby’s Gluten Free Bakery in Denver, CO. Although our crust is Certified Gluten-Free & made at a dedicated Gluten-Free facility, it is prepared in our pizza kitchen, which is not. There is risk of gluten exposure and possibility of cross-contamination. We always use a fresh pan and pizza cutter when slicing GF pies, but we must note that GF pies are not cooked in a dedicated GF oven. Therefore, BLP does not recommend our Gluten-Free pizza for customers with true Celiac disease. What’s in your GF crust? Full ingredient list: rice flour, sorghum flour, tapioca starch, potato starch, modified (non GMO) tapioca flour, rice bran oil, cane sugar, molasses, salt, yeast, and water. Deby's Gluten-Free crust is locally-sourced & also vegan! GF crusts are 12”, but will be delivered in a 14” box to distinguish its GF status. Can I order GF by-the-slice, or do I have to order a whole 12” GF pie? GF pizza-eaters rejoice! You do not have to order a whole 12” GF pie just for yourself (though we don’t judge!). Gluten-Free slices can indeed be made-to-order by-the-slice. Available for Dine-in, Take-out, and Delivery, anytime day or night. The slices are 1/6th of a 12” GF Pie. If you plan on dining in with friends, we’d recommend ordering them online for pick-up about 15-30 minutes before you arrive at the shop and they’ll be ready when your party arrives! Which of your bases & toppings are gluten-free? Please refer to the “Build Your Own Pies” section of our menu for our current offerings. Yes: Boss Lady Pizza is a nut-free facility. Are all of your salad dressings house-made? Yes. All of our salad dressings, including Bossy Sauce, are house-made! Is your Bossy Sauce vegan? No, it contains mayonnaise & buttermilk. What’s Bossy Sauce made of? That’s our secret :) But we can tell you that it is a nut-free, gluten-free, house-made chipotle ranch dressing, that contains dairy. Can I order ahead for a specific time later on today? Yes! You can place your full Take-out/Delivery order online, complete the check-out process, and then immediately give us a call to request the order for a future time! Just be sure to call immediately so we don’t start making your order too soon! Please do not write in the comments that you’d like your order for a later time because we will likely not see the note until it is too late—always best to call. We are working with our online ordering platform to offer ordering-ahead without having to call us afterward. Stay tuned for updates! Otherwise, you can always order for a time later today via phone (303-449-0909). Can I order ahead for a specific date in the future? You cannot place an order for a future date online; please place orders for future dates via phone. The larger the future order, the more time we will need to accommodate it. how much notice do you need for a large order? The more notice you can give us the better! Typically 1-4 pies can be ordered in-the-moment. 5+ pies we would prefer 24-48 hours notice whenever possible. i am part of a tax exempt entity and would like to order boss lady pizza tax exempt. How do I do that? We will follow-up with your final receipt (including tip) the following morning, after our POS has batched overnight. can i place my tax exempt order online? Absolutely! 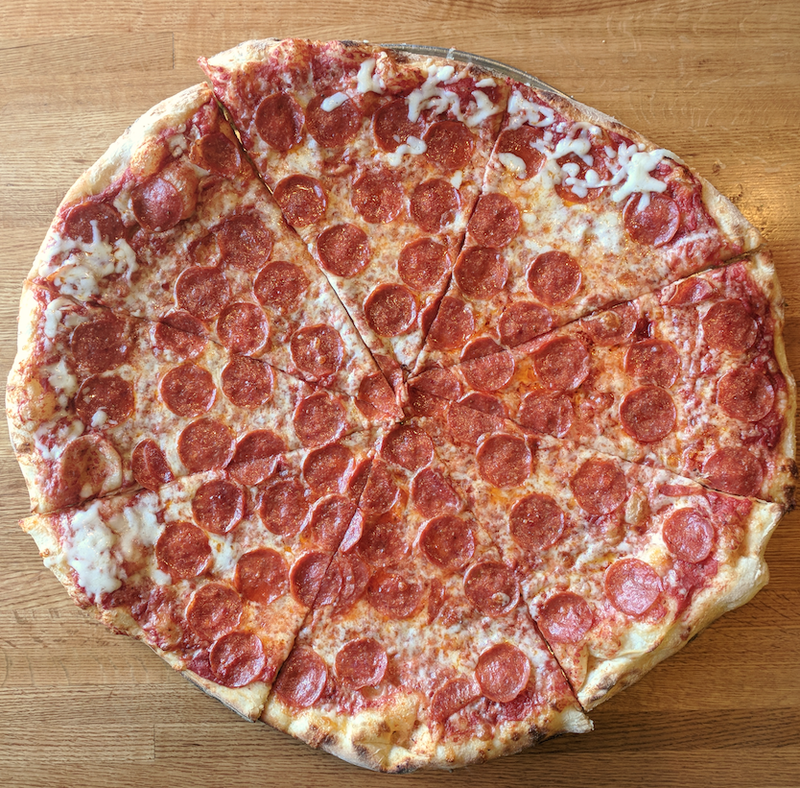 You can place your order on www.bossladypizza.com like usual, provide your Tax ID & Company/CU Department name on the checkout page, and pay in full with your with your credit card (tax will still be included at this point). Then give us a call immediatley after placing your order, provide the Ticket # (which you will see in your confirmation email), and we will remove the tax, adjust your credit card payment, and send you a new receipt! there is a problem with my recent order, what should i do? Call the restaurant the moment you notice a problem with your order, we are happy to help! But am I in your zone? If you’re not sure, click the button below, type in your address, and our system will automatically tell you if you’re in our zone! What if your website says my address couldn’t be found, but it’s clearly in the zone? Please fill out this form. It’s very rare, but our online ordering POS platform has rejected a handful of addresses in town that it shouldn’t have (a known issue with their map system). Please submit your address below so we can add it to their back-end manually. We apologize for any inconvenience. Thank you! Used to identify your account in the back-end. Used to follow up and let you know once the address has been added to the system. Thank you for submitting your address issue. We will be in touch shortly! ORDER DIRECT to save 25-36% on Delivery Fees! Our Delivery Fee is only $3 when ordering direct from our website (as compared to $3.75-$4.74 charged on other platforms). 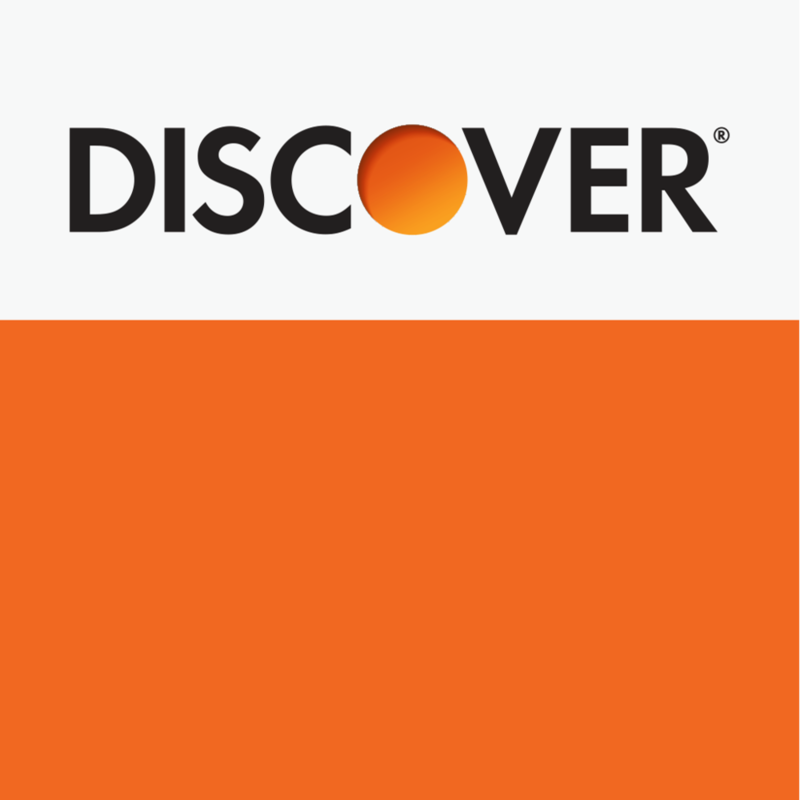 can i pay cash on delivery? If yes, how much change do your drivers carry? We accept cash payments on delivery for orders under $50 only. All orders $50+ require a Credit Card payment as it is unsafe for delivery drivers to carry large amounts of cash on their person. The safety of our Delivery Drivers is our top priority, so they typically carry a maximum of $20 in change. We do not prefer you pay with a $100 bill, but if you must, please ask the store directly for permission so they can decide if our driver is comfortable carrying additional change. how long does a delivery order typically take? Every BLP pie is hand-tossed and made-to-order. 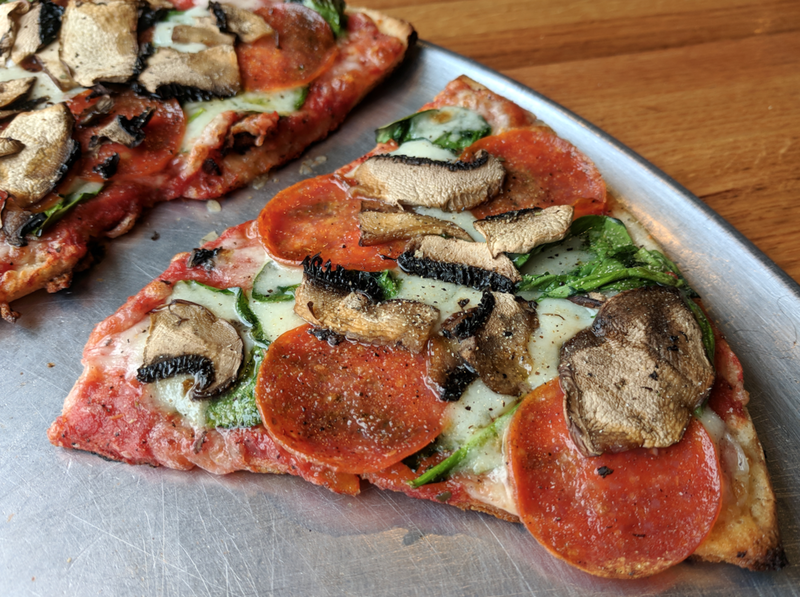 Our customers understand that we are not a big box chain; we are a small locally-owned 2-oven pizza shop whose top 2 priorities are Quality of Ingredients and Quality of Customer Service. We prioritize all orders based upon the order in which they are received. A typical delivery is quoted 45mins-1 hour, and this can increase from there depending on many outside factors. This means even if you live right down the street, you will not necessarily receive your delivery order faster than someone who placed their delivery order before you that lives across town. If you’d like to receive your order faster and you live nearby, we’d suggest ordering Take-out instead! For most accurate delivery quote estimate, visit our online ordering home-page. Can i order slices for delivery? Yes, you can order Regular Crust Specialty Slices for Delivery every day from Open - 8:30pm. Regular Crust Specialty Slices are not available for Delivery after 8:30pm. Regular Crust Vegan pies are not available by-the-slice at all. Vegan Regular Crust options must be ordered as a whole pie. GF Crust slices are made-to-order; because of this, they are available for Delivery, Take-out, & Dine-In anytime day or night. ; this includes Vegan slices with GF Crust as well. do you use hungrybuffs drivers for orders placed on hungrybuffs.com? No. We generally use our own Boss Lady Pizza-employed Delivery drivers 99% of the time. We only use Hungrybuffs drivers in emergencies (car trouble) or if we need the extra help. The little blue car on HungryBuffs indicates that a Hungrybuffs driver will deliver your order. Absence of the blue car indicates a BLP driver will deliver your order. can i tip my delivery driver? Absolutely! We pay our drivers Colorado’s tipped wage ($9/hr+ DOE) + $1 per order as a form of fuel reimbursement, so tips are always appreciated and recommended! When ordering direct online or via phone, your driver will bring a Credit Card receipt where you are able to add a tip & sign. There will also be a copy for you to keep, just ask! You are always welcome to tip in Cash. Hungrybuffs & Grubhub orders will not require a signature, and you are able to either add your tip during checkout online, or you may choose “CASH TIP”. Either way, if you are a grateful for a hot steamy pizza delivered to your doorstep, especially in inclement weather when you’d rather not leave the house, tipping your driver is the perfect way to show your appreciation! how long does a take-out order typically take? We prioritize all orders based upon the order in which they are received. A typical take-out order is quoted 20-30 minutes depending on the time of day, but can increase from there depending on many other outside factors. when I order take-out, do I have to wait in the regular customer line to pick it up? Nope! You can absolutely skip the line, just come right up to the counter and we’ll hook you up. can i pay with cash on a pick-up order? Nope, well at least not initially. Due to ongoing issues with past customers, and in order to protect our business, we’ve issued a policy where all Take-out orders must be placed initially with a Credit Card payment; this includes Online Orders and Phone Orders. Once you arrive for pick-up we can easily delete your credit card payment used to ‘hold’ the order, and switch it to Cash payment instead. In this case a “pending” charge would show on your Credit Card activity, but should disappear by the next day. A Credit Card is required to hold ALL Takeout orders; payment can be easily switched to Cash at pick-up. Cash payments are accepted on Delivery orders <$50 only. We generally do not accept $100 bills on Delivery. Gift cards & e-Gift cards can be redeemed in person or via phone order, for dine-in, take-out, or delivery! Currently we do not have gift card integration with our online ordering, and is a limitation we have requested our POS system to resolve. Ask it here using this form. Form submissions are not monitored 24/7, but we will do our best to get back to you as soon as we are able!